What are QR codes and how can they help your business? Keep reading to find out. Quick Response codes (QR codes) and other two-dimensional codes are expected to achieve widespread use this year – and for good reason. Consumers want immediate access to what’s relevant and QR codes are being used to make that possible. 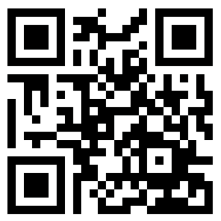 QR code to the Social Media Examiner home page. Bar codes are linear one-dimensional codes and can only hold up to 20 numerical digits, whereas QR codes are two-dimensional (2D) matrix barcodes that can hold thousands of alphanumeric characters of information. Their ability to hold more information and their ease of use makes them practical for small businesses. Any of these desired functions are easily achieved by properly creating your QR code. It’s a simple process of entering the appropriate data into the QR code generator, described below, and it all takes just a few minutes. The ability of QR codes to connect people with each other and to multimedia digital content is very useful for businesses and consumers alike. While QR codes are still considered a novelty here in the United States, they’ve been actively used for over a decade in Japan where they were invented. QR is a registered trademark of Denso Wave, a subsidiary of Toyota. Denso Wave has elected not to exercise their patent rights of QR codes and that has encouraged their widespread use. There are other software companies that have created 2D codes that work much like QR codes, with Microsoft being the most notable. Microsoft developed their own proprietary software to create codes known as MS tags. Unlike QR codes, which can be read by a number of different readers, MS tags can only be read by the Microsoft Tag Reader. MS tag to Microsoft Tag Reader app. Choosing to use QR codes or MS tags is a personal choice. It seems that MS tags presently allow for more possibilities for creative graphic designs, such as incorporating images and logos into the tag. Nevertheless, those capabilities have to be weighed against the reach and ease of use of open-source QR codes. 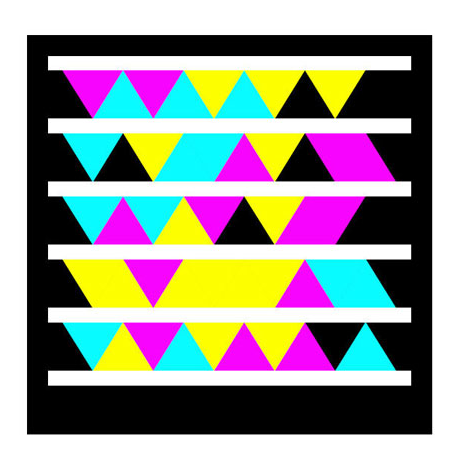 QR code Generators – There are a number of sites for generating QR codes and they’re all free. An Internet search for QR code generator will offer many choices. One that has worked well for me is Kaywa, a site created by Datamatrix, which is another pioneer of 2D codes. You can use it to create QR codes that link to a web page, text, phone numbers, or SMS. Another with even greater capabilities, including customizing the color and format of your codes is Kerem Erkan. QR code Readers – The QR code reader app that works well on my iPhone is i-nigma, which claims to be the most widely used reader in the world. It accommodates virtually any type of camera phone. For the android, you can also try Barcode Scanner. If you already own the popular price-checking app Red Laser, they’ve recently adapted their technology to accommodate QR code reading. Sharing – There’s no limit to how, or even how much, you can share with QR codes. While a video or landing page is easily shared, you could go further and share an entire eBook and even multiple pieces of content that share a common link. 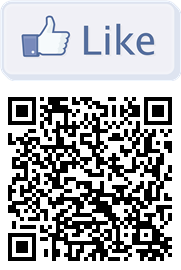 QR code Like button to the author’s Facebook page. Community – Sharing is how you build community, and one of the favorite arenas for doing this is Facebook. You can use Likify to create a QR code that links your mobile device to a fully functioning LIKE button for your Facebook page. This greatly simplifies the process of merging your other communities with your Facebook page – and it is all accomplished in one click. Additionally, the accompanying signature “thumbs-up” clearly suggests the purpose of the code. Calls to Action – After building a community, the next logical step is to mobilize them to take action. What are you trying to accomplish? You can alternate special offers by simply linking your QR codes to new landing pages, and you can combine then with email opt-ins to build your list. The QR code above takes visitors to a Facebook page welcome tab where the calls to action are Liking the page and a list opt-in. SEO and SMO – Earlier this month I wrote an article on social graphs where I discuss how web objects such as images, music clips, and videos add valuable content to your social graph. QR codes enhance both your search engine and social media optimization. 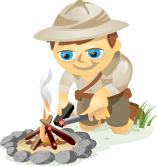 Now you can increase traffic to those searchable objects to further optimize them by encouraging more sharing. Social Proof – To help build a community offline, it can be helpful to use your vibrant online communities as social proof of your influence and expertise. As one example, you can use QR codes to link to specific blog posts that have earned an abundance of activity. Analytics – QR codes most commonly link to urls, which is why link shortening services bit.ly and goo.gl now automatically generate a QR code for sharing your shortened links. Using goo.gl as an example, you simply click on the “more” link after you create your shortened link, where you are taken to a page that not only gives you the QR code, but useful analytics. 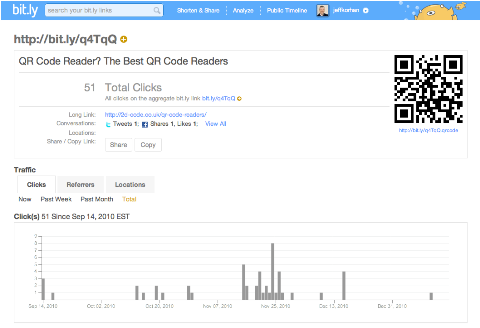 This screenshot shows how bit.ly serves up analytics and a QR code for a shortened link. Scan it to go to a list of recommended QR code readers. 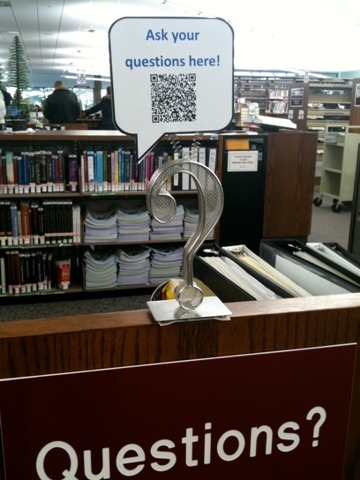 QR Code at the Naperville, IL Public Library assists visitors with helpful advice. A QR code on a café in Seattle, WA links to Google Places and reviews on Yelp and around the web. 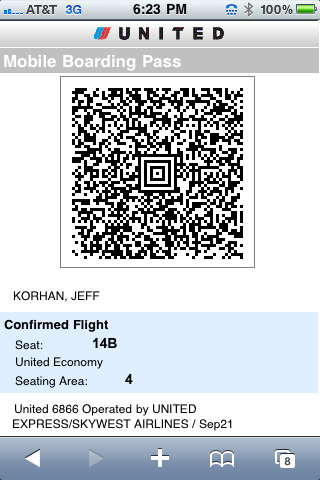 United Airlines – Many of the major airlines are now using 2D codes as digital boarding passes. I recently learned that by the end of 2011 all carriers will be required to provide this service for international flights. United Airlines 2D code boarding pass. I tried this myself and it works like a charm. My only suggestion is to not rely on the link, but rather to save a copy of the image on your phone. You don’t want to risk not being able to find a good signal when you need it most! 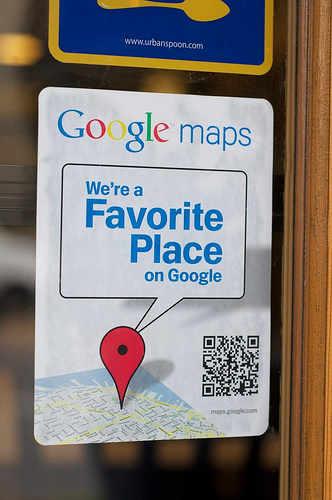 Google Places – When you register your local business with Google Places, you’ll receive a decal for your place of business that includes a QR code to your company website. Be sure that QR code links to the most relevant information that potential customers are interested in – such as hours of operation and current specials and offers. The Cure Starts Now Foundation – This non-profit foundation is creatively using QR codes in partnership with a local small business, and the results have been favorable for both organizations. The Cure Starts Now Foundation was started in 2007 by Keith Desserich and his wife Brooke, in honor of their six-year old daughter Elena, who died of brain cancer. They partnered with Graeter’s Ice Cream, based in Cincinnati, OH, who created a special flavor of ice cream for the cause – Elena Blueberry Pie. The marketing campaign used a QR code linking to the Cones for a Cure landing page, where your contact information is exchanged for a coupon for a free scoop of Elena Blueberry Pie ice cream. Cones for a Cure billboard with QR code. The campaign not only surpassed the fund-raising goals, but it also helped to increase revenue and distribution for Graeter’s – who actively participated in the fund-raising on a per scoop basis. The campaign will be rolled out again next year in twice as many cities. The potential for QR Codes is limitless. What’s most exciting is how they take what social media is doing well now, bringing people together with technology, and extending it to enhance the experience. The next generation of barcodes will hold even more information – so much that an Internet connection will not even be necessary. The content will be effectively embedded in the code. Imagine scanning a digital code to manifest physical reality? It’s amazing to consider where this can go. How about you? How can you use QR codes to take advantage of this phenomenon? Leave your comments in the box below. 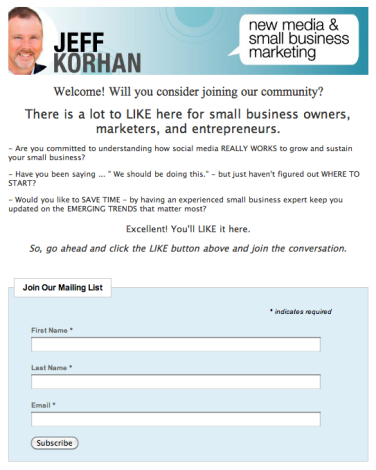 Jeff Korhan is a professional speaker with over two decades of small business ownership. He helps mainstream small businesses use social media and Internet marketing to create exceptional customer experiences.